Why Aren’t Ergonomic Keyboards Ubiquitous? I made a note to write something about my “brilliant” idea and left it. 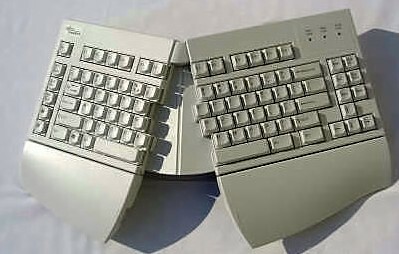 When I came back to it, I thought I’d do a little bit of research and see if someone had already invented the ergonomic keyboard I was imagining. Turns out, they have: ErgoSplit Keyboard. I’ve included a picture of it to the left. At first, I was a little disappointed because I thought I’d come up with a great idea. Then, I was happy – someone already did it! Then, I was disappointed again. How come ergonomic keyboards are more prevalent? I haven’t worked in an office in some time, but when I imagine a computer workstation or when I see pictures of computer workstations, rarely do I see an ergonomic keyboard. I would think with the research that OSHA (and others!) have done, there’d be a higher demand for ergonomic keyboards. And on that note, when most folks think of ergonomic keyboard, they think of the picture in the first paragraph (at least I do). How come there aren’t more people who are interested in ergonomic keyboards like the one in the second picture? When I imagine using it, it feels like it’s a more natural position than the “original” ergo keyboard and leaps and bounds more ergonomic than the plain keyboard. This entry was posted in Health and tagged Ergonomic, Fresh Perspective, Furniture, Hardware, keyboard, Occupational Safety and Health Administration, Peripherals, Safety, Typing, Workplace Safety, Workstation, Wrist. Bookmark the permalink. Really nice read, they had never even really been on my radar because I hardly ever saw them in use. I just assumed they weren’t worthwhile. 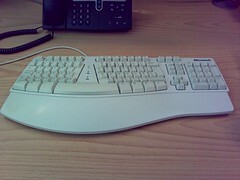 Then I began experiencing a bit of pain and a friend urged me to try a ergonomic keyboard. It ended up making a huge difference!